Europa Editions are serialising Massimo Carlotto's Death's Dark Abyss on their Tumblr site. The prologue and chapter one are up, check back weekly for the next chapters. 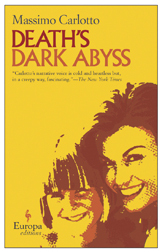 Read the Euro Crime review of Death's Dark Abyss. "Over the next few months, Europa Editions will be giving you a preview of one of the best noir writers in the world, Massimo Carlotto. Starting today, you can read Carlotto’s Death’s Dark Abyss absolutely free right here! Death’s Dark Abyss tells the story of two men and the savage crime that binds them. During a robbery, Raffello Beggiato take a young woman and her child hostage and later murders them. Beggiato is arrested, tried and sentence to life in prison. The victims’ father and husband, Silvano, plungers into an ever-deepening abyss until the day, years later, when the murderer seeks his pardon and Silvano turns predator as he ruthlessly plots his revenge. Twice a week, we’ll post chapters from the book, leading up to the launch of the new Europa World Noir series on May 7th!"